The Texas A&M women are primed to make a run on night 3 of the SEC Championships, with 8 A finalists and two top seeds courtesy of Sydney Pickrem (400 IM) and Sarah Gibson (100 fly). 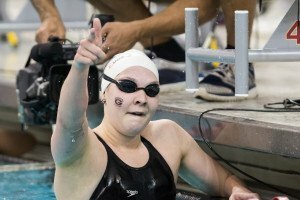 Georgia will try to counter with 200 free leader Brittany MacLean and four A finalists of their own. Meanwhile Tennessee actually leads the team points and could see senior Amanda Carner move up from second place to challenge Pickrem in the IM. Meanwhile Florida’s men hold a 7-point lead over Auburn after Caeleb Dressel shocked the world on day 2 with the two fastest 50 freestyles in history. Dressel leads the 100 fly tonight. Tennessee’s Sam McHugh is the top 400 IM seed and Georgia’s Matias Koski looks to defend his 200 free title. Keep refreshing this page for event-by-event updates in real-time. Texas A&M freshman Sydney Pickrem held her top seed as the Aggies kicked off night three in the absolute best way possible: a 1-2-3 sweep of the 400 IM. 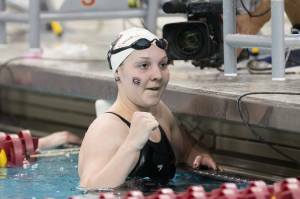 Pickrem, one of Canada’s top young swimmers internationally, went 4:05.32 for a new pool record and an NCAA A cut. This comes a day after Bratton and Galat went 1-2 in the 200 IM, and it also vaulted A&M past Tennessee and Georgia for the team points lead. Georgia’s Emily Cameron was 4:07.60 for fourth, followed by a pair of Volunteers: Amanda Carner (4:08.59) and Lauren Driscoll (4:09.15). In fact, though, the fourth-fastest time overall came out of the B final, where Alabama sophomore Mia Nonnenberg went 4:06.99 for 9th place overall. Nonnenberg had to scrape for an NCAA invite through a last chance meet in 2015, but should be safely into the big show with her finals time. Georgia’s Jay Litherland was just 6th coming out of prelims, but found five more seconds worth of speed to go 3:40.33 and keep the SEC 400 IM title in the Bulldog family. Chase Kalisz had won the title for the past three years, but is sitting out this season on an Olympic redshirt, opening the door for Litherland. The sophomore was extremely patient in the race, trailing the lead dogs for 300 yards before dropping the hammer with a stunning 49.03 split on the freestyle leg. Auburn’s Joe Patching, coming off a 200 IM win a night earlier, jumped out to a big lead on fly and back, leading the field by three full seconds at the halfway mark. At that point, Florida’s Mark Szaranek was second, with Litherland third. Both Szaranek and Litherland caught up a bit on the breaststroke, but Patching actually led all the way up to the 350-turn in the freestyle leg. Litherland was unstoppable in taking the win, but Szaranek also went by Patching for a second-consecutive runner-up finish in the 400 IM. Szaranek was 3:41.88, with Patching coming in at 3:42.71. Georgia’s Gunnar Bentz was fourth in 3:43.73, and Tennessee’s Sam McHugh, the top seed out of prelims, went 3:44.27 for fifth overall. The 400 IM more than any other race is about gamesmanship between prelims and finals, and that was on full display here, with the entire top 5 dropping time from morning to evening, some of them in big chunks. A good event for Florida helped them extend their lead on Auburn in the team points. A 7-point margin expanded to 32 after the IM, with Georgia a distant third place. The Aggies kept on rolling through the second women’s event, nabbing a second-straight sweep of at least the top two spots. Sarah Gibson followed up her nation-leading prelims swim of 50.99 with a 51.17 that tops every swim in the NCAA this year besides her own. Meanwhile Beryl Gastaldello, who won this event last year with Gibson swimming the 200 free, went 51.46 for second place, beating out Tennessee’s Maddie Banic. Banic, the freshman who led the NCAA heading into this meet, was 51.79. 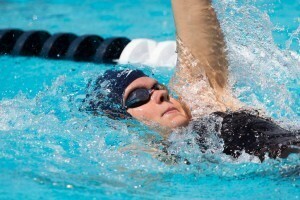 That’s only about six tenths off her mid-season swim, continuing an outstanding rookie year. Georgia’s Kylie Stewart went 51.85, eking out fourth over Natalie Hinds from Florida (51.87). Interestingly enough, even though A&M went 1-2 in the race, Tennessee had four scoring swimmers (two of them in the A final with Banic and 8th-place Harper Bruens at 52.99) and actually gained ground on the Aggies. Texas A&M leads by just a single point after the fly, but they and Tennessee have put more than 70 points between them and defending team champs Georgia. Make it 2-for-2 for Caeleb Dressel, who’s been the star of this meet individually. The Florida sophomore went a lifetime-best 44.80 to break the SEC meet record and his own pool record. That time jumps to the NCAA lead, unseating defending NCAA champ Joseph Schooling of Texas. Dressel could potentially swap out the 100 fly for the 100 breast at NCAAs, but tonight’s big swim suggests he might be able to challenge the Longhorn duo of Schooling and Jack Conger (44.51 and 44.55 last year) in the butterfly race. Dressel’s time would have been third at last year’s NCAAs and is just seven tenths off the American record. LSU’s Logan Rysemus came up with a huge swim of his own to take second overall. 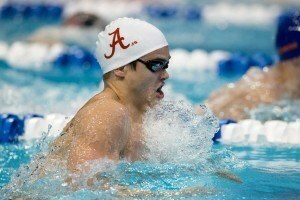 The junior was 45.59, a new lifetime-best and ranked #4 in the NCAA behind Dressel and the Longhorns. Arthur Mendes also got under 46 for Auburn at 45.98, a tick off his prelims swim as Auburn continues to run in second place as a team, now more than 100 points ahead of Georgia. Florida’s Jan Switkowski touched out Georgia’s Pace Clark for fourth, 46.16 to 46.17. Behind them, LSU’s Alex Linge dropped three tenths to win his own touchout, 46.36 to 46.39 over Missouri’s Andrew Sansoucie. Georgia finally came up with an answer to the Texas A&M onslaught with a 1-2 finish of their own in the 200 free. Brittany MacLean won her second title of the week, going 1:43.64 to set a new pool record. Defending conference champ Amelia Maughan was just fourth in 1:45.76, more than a second slower than she went at last year’s meet. Texas A&M did manage to mitigate the points Georgia made up, though, by stacking three swimmers into the top 8. Meredith Oliver (1:46.34), Kristin Malone (1:46.37) and Claire Rasmus (1:46.49) went 5-6-7 for the Aggies, with LSU’s Danielle Stirrat taking 8th in 1:47.26. That pushed the Aggies back into the points lead by 12 over Tennessee. Georgia and Texas A&M made up some big ground on the Vols, who lead UGA by 61 for second place heading into day 4. Georgia’s Matias Koski successfully defended his 2015 title in the men’s 200 free and gave the Bulldogs a sweep of the 200 freestyles this year. His 1:33.43 is just a tick slower than he went at this meet last year, but Koski has already been 1:33.0 this season at the Georgia Invite. Auburn’s Hugo Morris had a big finals swim, too, dropping seven tenths of a second and challenging Koski most of the way. Morris was just .01 back at the 100 mark, and finished second in 1:33.65. Missouri’s Michael Chadwick blasted a lifetime-best 1:34.11 to earn bronze, beating out last year’s runner-up Mitch D’Arrigo of Florida (1:34.26). Mizzou’s other two A finalists took 5th (Mikel Schreuders in 1:34.35) and 6th (Carter Griffin in 1:34.48), with all three Tigers besting their prelims times. The Gators got a B final win from Pawel Werner to extend their lead on Auburn to 54, and Auburn now sits almost 100 points ahead of Georgia in the team race. A&M is racking up major points so far tonight! Apologies accepted CraigH and Notgoingtohappen! Dressel was out in 20.44 on that 100 fly. Wow! 44.8 bodes wells for his 100. What is congers best 100 fly? I believe both Schooling and Conger were 41.5x at NCAAs last year. I recall that Schooling won by a touch!